If you find yourself reading this article, chances are you’re toying with the idea of purchasing a playground set for your child. Well, we fully support that idea! Playgrounds allow your child to engage in imaginative play outdoors and reduce their stress levels through exercise. Before you purchase the first one you see think about the size of your yard, the materials used, the age of your child, and the features it includes. Thinking about these factors as you read through our list of the best playground sets will help you find the perfect one for your family. Playgrounds are a wonderful way to get your kids off those screens and to enjoy the outdoors. 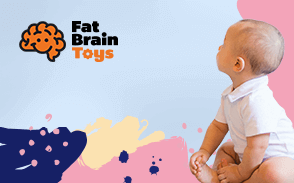 They help promote a healthy lifestyle for your little ones. We made sure our list had the highest rated playgrounds that the market has to offer. We also converted this layout to our new buying guide format. 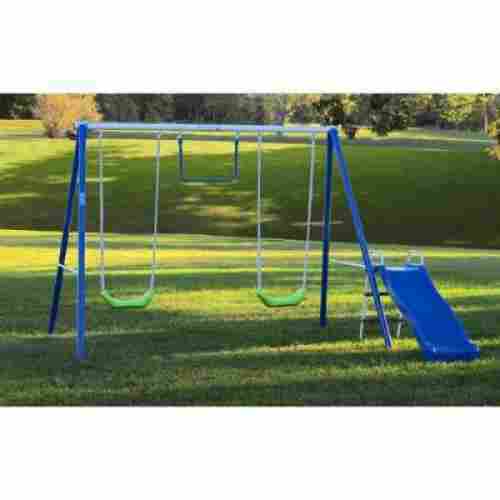 If you don’t have the room for a giant playset but you want something that will allow your child to have fun while keeping them active, the Lifetime Swing Set is perfect for your yard. This set is equipped with two belt swings and a trapeze bar. Children between the ages of three and twelve will have a blast swinging on this set. When purchasing you can choose between an earth tone or primary color scheme. Constructed out of powder-coated steel and polyethylene, it is highly durable and sturdy. There’s no need for cement or any anchoring as it is free standing. The material is all weather and UV-resistant, thus guaranteeing it will not fade, rot, crack, chip, peel, or warp during the changing of the seasons. For added safety, the edges are either rounded or covered with plastic caps. The chains on the swings and the trapeze bar are covered with a soft plastic rubber grip, thus eliminating the possibility of the chains pinching your child’s fingers as they play. Does not require weights, cement, or anchors. 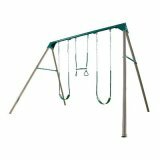 The Lifetime Monkey Bar Adventure Swing Set with 9 Foot Wavy Slide is an awesome, large backyard swing set complete with three swings, monkey bars, trapeze bar, ladders, and wavy slide. This backyard playground set is made with heavy, durable materials that provide weather- and UV-resistance for many years of use. 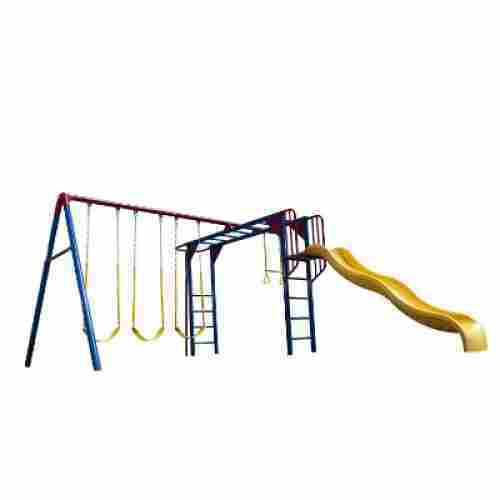 It is a high-quality swing set, passing all safety standards for playgrounds. 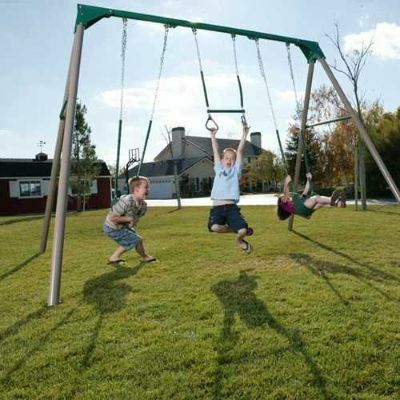 All edges and corners are covered with plastic to avoid any risk of scraping, and the swing’s metal chains are covered with long rubber tubes to avoid any risk of injury. This swing set provides the incentive for kids to play outside and have fun while getting some fresh air and vitamin D. Physical activity provides emotional and mental wellbeing and is essential to a healthy body. This swing set also provides the opportunity for children to nurture their imaginations if they decide to play roles such as adventurers or princesses. 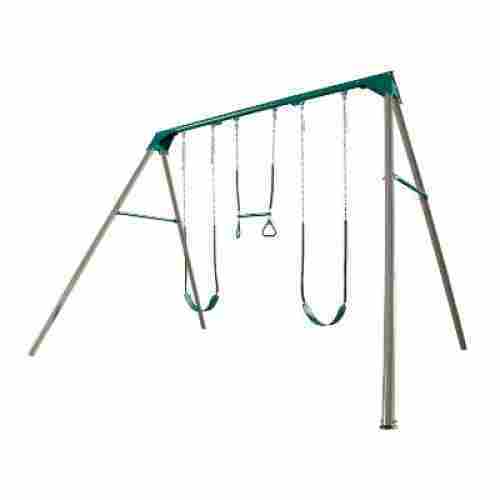 This is a swing set for a relatively large space, as it covers an area of 13.8 feet by 18.6 feet. The Lifetime Monkey Bar Adventure Swing Set is a safe, sturdy, classic swing set that can entertain children of all different ages for years to come! The primary colors option is red, yellow, and blue with a yellow slide and the Earth tones color option is an Earthy green and olive-beige with a green slide. The set comes in parts, with detailed instructions for assembly and clear labels for all the included pieces. 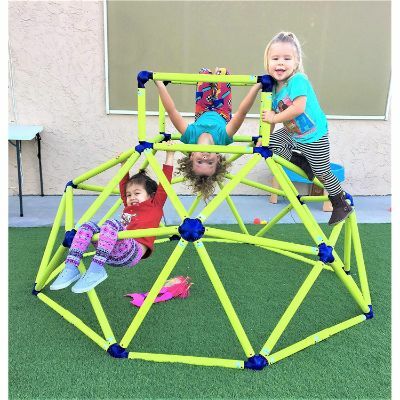 Lifetime’s Geometric Dome Climber Play Center is a strong, climbing dome made with weather-resistant, coated steel bars It can handle up to 600 pounds at a time, allowing multiple children to climb at the same time. The base of the dome has a diameter of 10 feet, and is 5 feet high at the highest point. 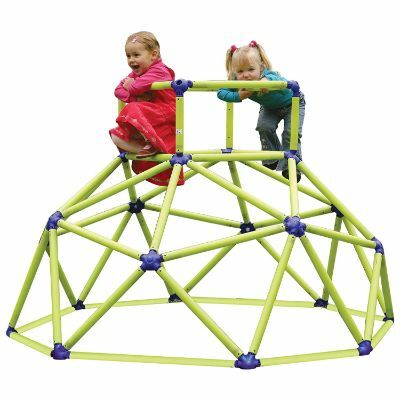 The Lifetime Geometric Dome Climber Play Center is a fun and unique playground set designed for children between the ages of 3 and 10 years old to enjoy. 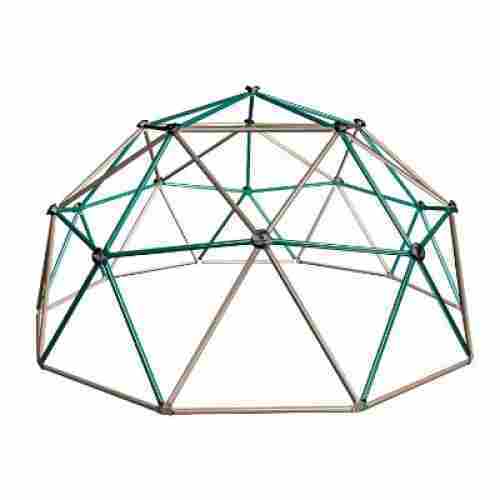 Your child will have a blast scaling this dome and reaching the top, with the added benefits of strengthening muscles, developing gross motor skills, and coordination. A healthy body is an essential component of holistic wellbeing, and climbing is a great physical activity to promote strength and health. The development of gross motor skills involves mastering large coordinating movements performed with the arms, legs, feet, or the entire body. This playground set is appropriate for children between the ages of 3 and 10 years old. 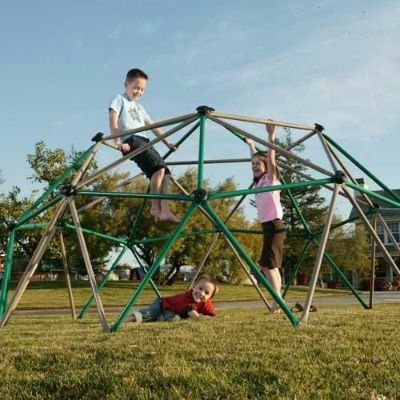 Every triangle composing the dome includes high-density polyethylene (HDPE) climbing hold on its three points, providing numerous strong grips for kids to safely climb the structure. The dome climber comes in two color options: primary colors or Earth tones, depending on preference. The dome comes in parts with detailed instructions for proper assembly and carefully labeled pieces. This dome climber is a great way for children to have fun climbing while building muscle strength and coordination skills. 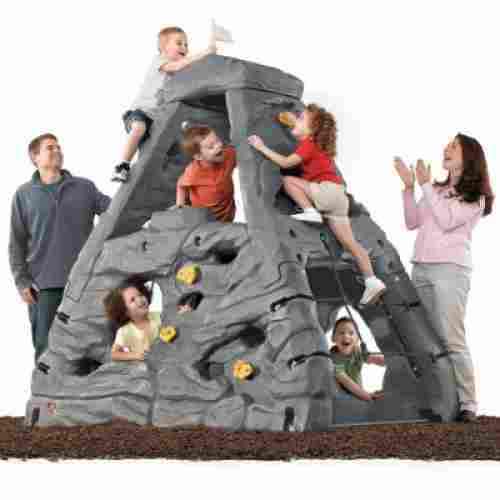 This playground set is an awesome option primarily for climbing. It’s not too big where it can fit in a smaller or moderate sized yard. 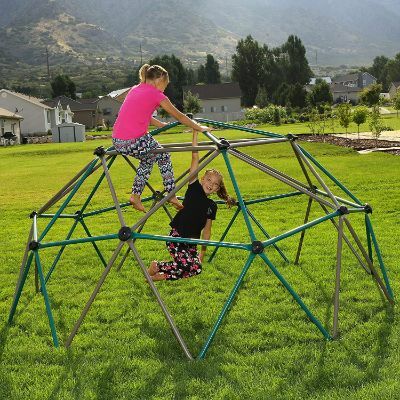 It is highly rated by a large number of customers who are satisfied with the dome’s safety and durability, and with their children’s enjoyment. 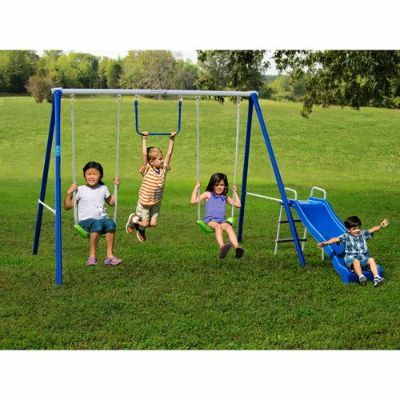 The Flexible Flyer Fun Time Metal Swing Set comes with two swings, a slide, and trapeze bar. It covers an area of 120 inches by 90 inches and stands 70 inches tall. The maximum weight capacity is 630 pounds. 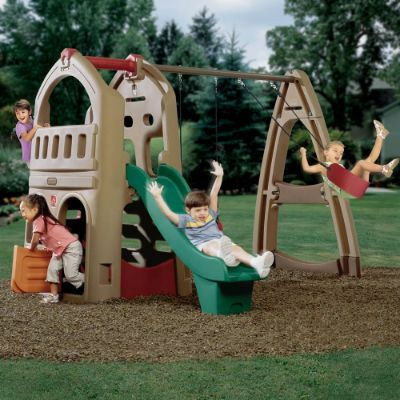 The Flexible Flyer takes much faster than other playground sets to assemble, at only a few hours’ maximum assembly time. This little mini swing set by Flexible Flyer is an awesome option for youngsters between the ages of 2 and 6 years. The swings provide cardio exercise, strengthening muscles throughout the entire body. Additionally, the swings promote the development of full-body coordination and gross motor skills. It is recommended for children between the ages of 2 and 6 years old. 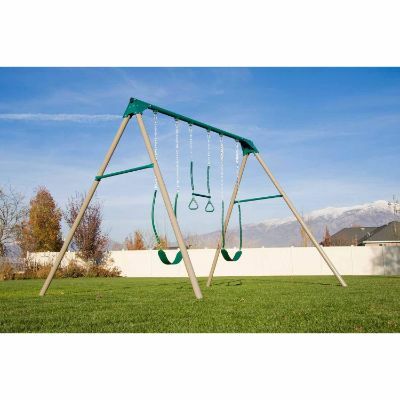 The Flexible Flyer Fun Time Metal Swing Set needs to be assembled, and it comes with metal stakes to anchor it to the ground for added stability. It is constructed with powder-coated steel and UV-resistant coating for durability over time in various weather conditions. The trapeze bar provides the opportunity for kids to have fun while developing upper body strength. Playing with this playset will have your little one growing and gaining confidence along the way. Enhance the fun of your child’s outdoor adventures with the Lifetime Adventure Tower Deluxe Playset. Your child can have a blast by themselves or enjoy the set with friends as there is plenty of room. It is completely free standing, thus you won’t have to worry about installing it with cement. 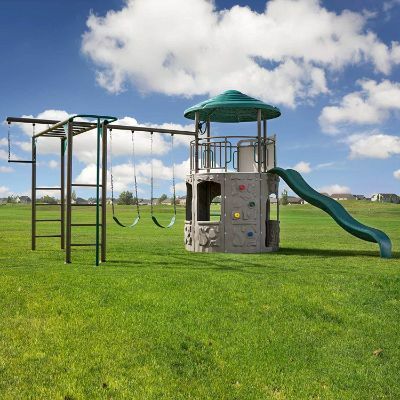 Your child can enjoy playing on this set for years to come as it is all-weather and UV-resistant. It will not warp, crack, or rot. 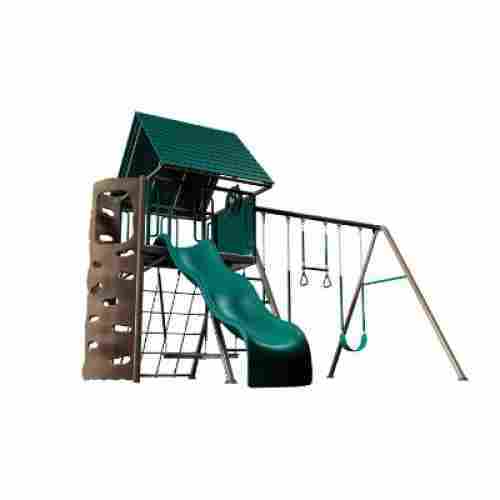 The entire playset is made out of a powder-coated steel and high-density polyethylene which makes it highly sturdy and durable. The clubhouse is equipped with a hardtop roof that will provide your child with shade during those hot summer days. They can also experience shade in the bottom half of the tower. It’s weather resistant material and high level of durability will allow you to pass down this set for generations. 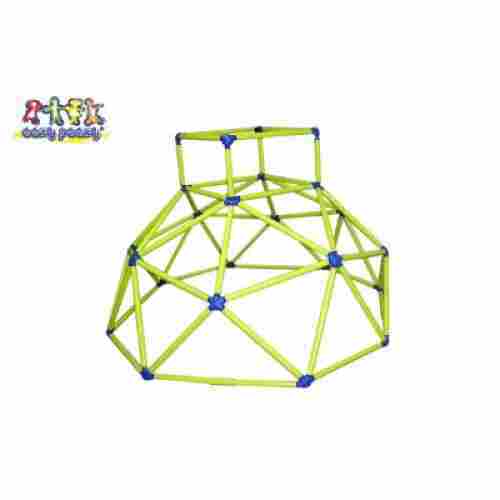 The Toy Monster Monkey Bars Climbing Tower is a dome-shaped geometric climbing tower with monkey bars at the top. The climbing tower is made of interlocking plastic tubes that are coated with non-toxic UV-protection to ensure resistance to degrading in the sun over time. It can hold up to 150 pounds at one time, which means multiple little ones can play and climb at the same time. Designed for children between the ages of 3 and 8 years old, it is a great playset for little climbers. It is portable, and be used either indoors or outdoors and moved easily. The fully assembled climbing tower is 70 inches by 65.5 inches by 46.7 inches. The colorful design comes with lime green bars and blue connectors. Little kids are bound to get creative with their imaginations as they climb and explore the dome. It can be used by more than one child with a total weight capacity of 150 pounds, providing the opportunity for social, interactive play while experiencing physical benefits. 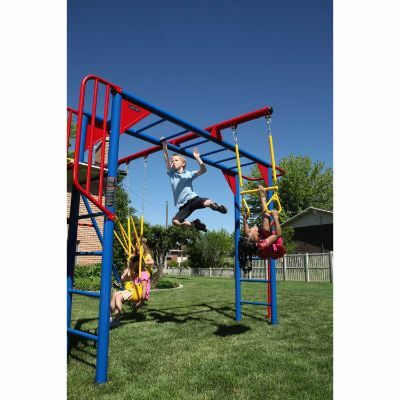 The Toy Monster Monkey Bars Climbing Tower gets kids physically active- indoors or outdoors. Climbing on this geometric dome helps young children build muscle strength and coordination while developing gross motor skills. The monkey bars are an additional fun challenge at the top portion of the climbing tower, which are even more effective at building upper body strength. The Playhouse Climber includes two swings, a slide, a secret lower playhouse with a swinging door, a ladder, and upper deck. The Playhouse needs to be assembled upon purchase, but it is easily assembled with minimum hardware. 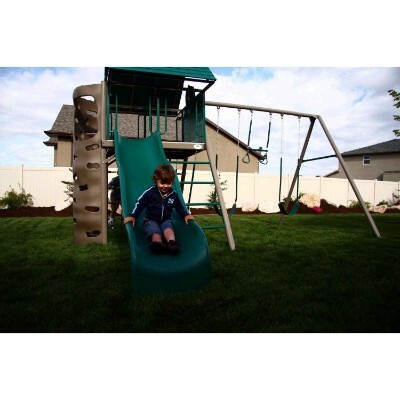 The Step2 Naturally Playful Playhouse Climber and Swing Set Extension is a great backyard playset for younger children between the ages of 3 and 8 years. It includes a swing, slide, ladder for climbing, and a two-level playhouse. When your children explore this playhouse climber, they will be physically active while developing muscle strength, balance, gross motor skills, sociability, creativity, hand-eye coordination, and imagination. It can be enjoyed by one child or many at once. Young children will be excited to play outside and get physical while playing pretends and imagining endless opportunities inspired by the adventurous features of the playhouse. Another great option from Step2, the Naturally Playful Playhouse Climber and Swing Set Extension has lots of features recommended for young children between 3 and 8 years old. The dimensions of the fully assembled playhouse are 75 inches by 110 inches by 115 inches, a moderate size that many backyard spaces can hold easily. The maximum weight capacity is 250 pounds, allowing for multiple children to play together at the same time. It has a colorful design, and kids will truly love to play and grow with the Step2 Naturally Playful Playhouse Climber and Swing Set. 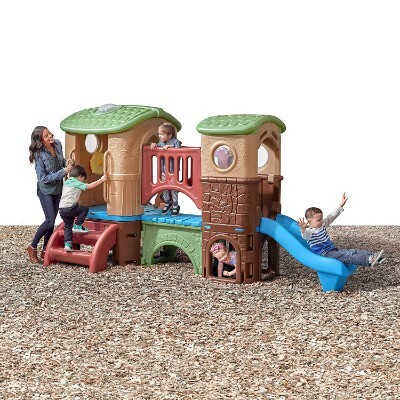 This Step2 playset combines the imagination-based play of the All Around Playtime Patio with the physical activity of the All-Star Sports Climber for a well-rounded, multifunctioning playset. 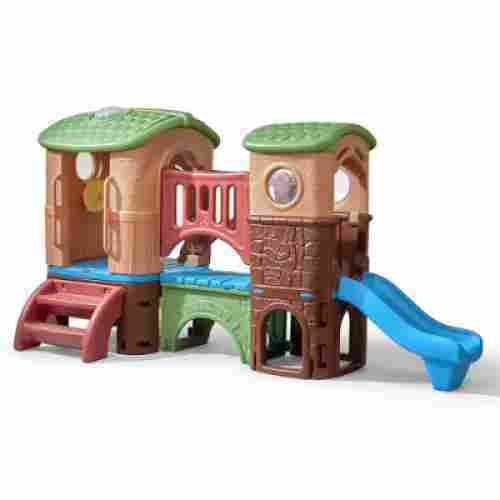 The Clubhouse Climber’s features include a lookout tower with observation windows, a rooftop skylight, steering wheel, non-slip stairs, a bridge, two slides, secret hideout, and a tunnel for crawling. It is safe and sturdy, with a maximum weight capacity of 240 pounds at a time. 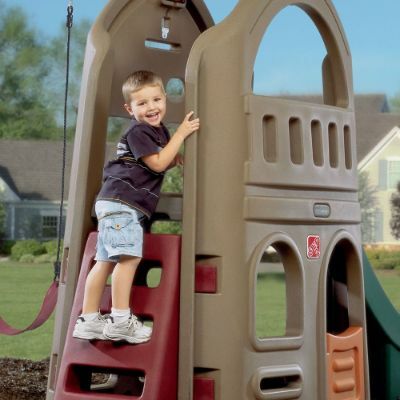 The Step2 Clubhouse Climber is an awesome option for children between the ages of 2 and 6 years old. Its functions and activities cater to imaginative and athletic children, promoting physical activity and creative social play. The entire playset has a base area of 123 inches by 56.8 inches, and it is 70 inches high. The Clubhouse Climber requires assembly upon purchase and comes with a detailed installation manual. The Step2 Clubhouse Climber has a lot of awesome functions for younger children, and yet it doesn’t take up a huge amount of space. It is colorful and sturdy and doesn’t need to be anchored so it can be moved around easily. It will encourage imaginative play as well as physical activity for little ones as they explore all the included features. 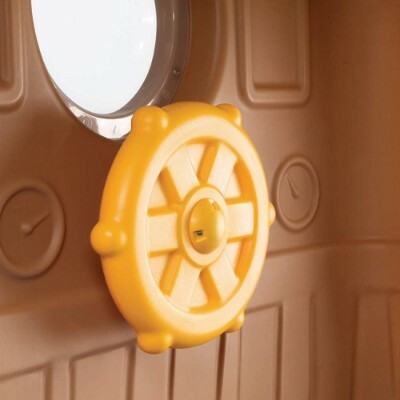 Your child will have fun exploring the numerous built-in functions such as the rotating steering wheel, two slides, observation tower, and crawling tunnel. Playing on this playset encourages growth on many levels. Kids will feel like real kings (and queens!) of the hill with this incredible Step2 Skyward Summit Playground. 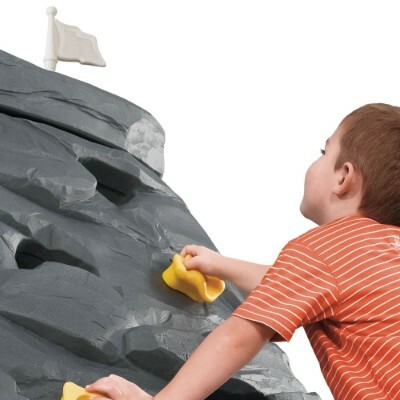 The design features four different climbing surfaces so your child will always have a new challenge to conquer. The Summit playground can hold up to 320 pounds of weight at once (which equates to roughly four children), and one child of up to 80 pounds on the platform. Kids love climbing. And with rock climbing gyms being such a trendy fad right now, the Skyward Summit sets them up for future adventures once they’re old enough to venture out to larger walls and climbs. The various textures and challenges on the Skyward Summit allow children to climb in a variety of ways without getting bored or feeling stagnant. Rope nets and hand grips give children the opportunity to work grip strength, arm strength, leg muscles, coordination, and problem-solving skills as they chart the best path towards the top! It’s smaller than traditional play structures and requires far less assembly. So if you’re looking for some diverse, innovative fun that can keep it compact and quick-to-build, the Skyward Summit is for you. The hand grips are soft and just the right size for tiny hands to grasp. While this structure isn’t a traditional playground, it certainly offers the opportunity for plenty of active outdoor fun. 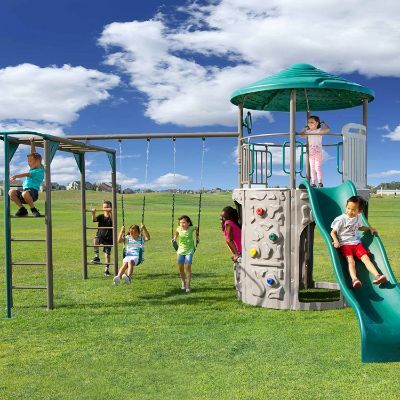 This freestanding playground set includes a 9-foot wavy slide, a trapeze bar with gym rings, a slotted climbing wall, two swings, a propeller swing, activity board, chalkboard, steering wheel, and a wall of cargo net for climbing. It is constructed primarily of strong, coated steel for durability and weather-resistance. This playground set, complete with a 9-foot wavy slide, swings, climbing wall, activity chalkboard, cargo net, covered clubhouse, steering wheel, and trapeze bar, is truly a child’s dream playset. 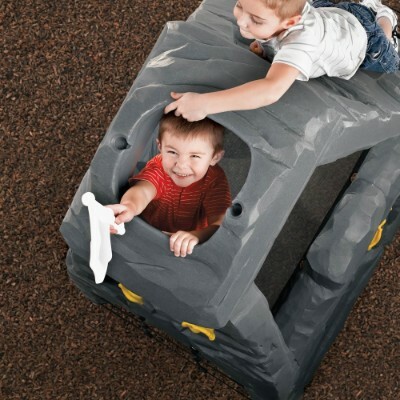 The activity chalkboard and steering wheel provide inspiration for creative, imaginative play. The climbing wall, swings, and cargo net are ideal functions for promoting physical activity and muscular development. In a world where kids are spending more time indoors with electronic devices and less time outside playing, this playground set is the perfect motivation for your children to be outside. The Lifetime Big Stuff Adventure Playset is a wonderful option for children from age 3 all the way up to age 12 can enjoy it for many years. The Lifetime Big Stuff Adventure Playset is decked out with tons of functions and accessories for kids between the ages of 3 and 12 years to enjoy. High-density polyethylene composes the climbing wall and other parts, ensuring durability with non-toxic materials that withstand weather and use over many years. Covering the ground with an area of 13.92 feet by 15.75 feet, this playground set requires a large space for set up. With all of its activities and functions, children have endless fun and experience well-rounded benefits playing on the Lifetime Big Stuff Adventure Playset. 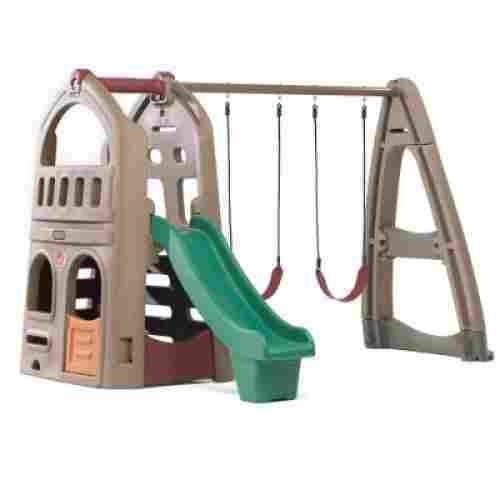 This playset comes in two different options for color: primary colors with red, blue, and yellow with a yellow slide, or Earth tones which incorporates an Earthy olive-beige and forest green with a green slide. The Big Stuff Adventure Playground Set is designed with safety as a priority. It passes all playground-related safety standards and performance requirements. When looking at playground features one thing that we paid close attention to when coming up with our top ten list was making sure that each playground was appropriate for younger children as well as would stick around as they are older. Having a playground helps parents promote a healthy lifestyle for their children as well as lets your child enjoy the outdoors enhancing their physical and motor skills. Steel is a great option, but we find that a powder coating is important to protect it from the risk of rusting in moist climates. Wood is also a sturdy material for playgrounds if it is properly treated to prevent rot and other weather-related damage. All the wood playground sets we included on our list are cedar stained with some sort of added sealant for protection. 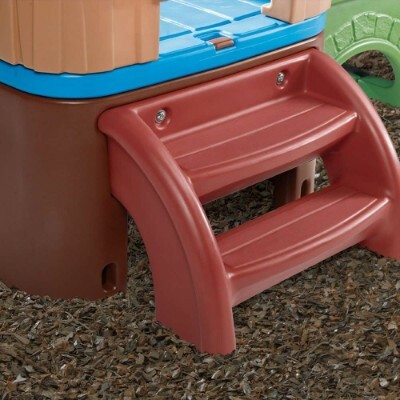 A few of the smaller plastic playsets for toddlers are durable considering the small size of the structure, and most are intended for indoor or outdoor use. Durability is an important factor we considered in evaluating the best playground sets. Buying a playground set is a bigger investment than purchasing a new book or toy for your child. A playground set made with durable materials will not only ensure safety but will also help in lasting at least a few years. Most of the playground sets we included on our list are meant to be set up outside. Unless you have a canopy or overhang, it is important to consider durability so that your playground set will last in various weather conditions such as the intense sun, rain, or moisture. When choosing the ideal playground set for your family and space, you usually have the option of steel, wood, or plastic materials. We wanted nothing but the best of the best for your children. When coming up with our top ten list we made sure we had the highest rated playground sets that the market had to offer. We wanted to make sure that we showed a variety that would suit every families needs. Most of these playground sets are colorful, bright and sturdy. All of the playground sets included on our list are carefully designed with safety as a priority for the age range recommended by the manufacturer. Of course, there are different safety concerns for a smaller plastic playset for toddlers than there are for the big multi-child swing sets. The design is important to assess when evaluating playground sets. For example, if the swings on a playset have metal chains to hang from, it is usually a smart idea to include protective plastic tubing in the range where a child’s hand will grip the chain. This design component is just an example of a safe playground set versus one with more risk of injury. We firmly believe that safety is the most important thing to consider when buying anything for your child. 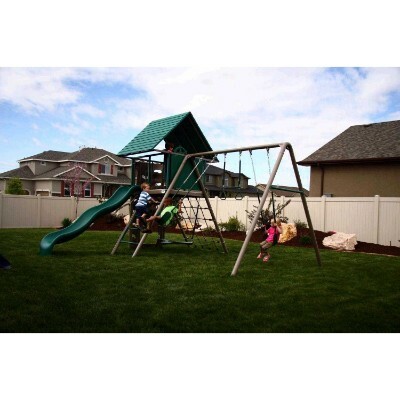 When it comes to playground sets, this is especially important as these structures include features such as swings that can be dangerous if not properly engineered and assembled. In selecting all the playground sets for this list, our researchers made sure to only include playsets that pass safety standards and that satisfy parents who have bought them. Important factors considered in assessing the safety of playground sets are spacing and design. For example, swing sets with multiple sets of swings should be spaced apart enough so that even if one child were to sway off course while swinging, it would not be close enough to collide with any structural bars nor the child on an adjacent swing. Another example of the importance of spacing in playground safety is that playground sets should be set up in an area with ample space surrounding the playset. If a child going down a slide lands anywhere between one and four feet away from the end of the slide, there should be an extra few feet of space to allow for extreme cases. Whether it be the small plastic playsets for toddlers or the huge 10-function swing sets, the playground sets on our list all promote physical activity for their targeted age range of children. Childhood obesity is plaguing the United States and is only on the rise. A general lack of a nutritious diet is absolutely a major factor in this serious epidemic. However, the role of decreased physical activity on a collective level is contributing heavily to this health problem. Playground sets provide the incentive for children to want to go outside and play. They are a lot of fun and provide the opportunity for practicing physical movements that promote healthy bodies and the development of many important skills. For example, climbing ladders or rock climbing walls included in certain playground sets helps to build muscle strength in the upper and lower body muscle groups. Swinging on swings is a cardio exercise that burns calories while working out the legs, arms, and core. Ultimately, just being outside and on their feet is better for children than sitting inactive indoors, participating in screen-time activities such as video games and watching television. q: Are playground sets safe for children? Yes, all the playground sets included on our list are safe for children as long as they fit into the age range specified by the manufacturer. q: Are playgrounds going to last the winter ok? We cannot guarantee that a playground set will survive a winter without any weather-related damage. However, we did select playground sets that are made with weather-resistant materials such as wood with stains or steel with powder-coating in order to help protect against weather over time. q: Do these playground sets come assembled? No. All the playground sets on our list require assembly ranging from two to multiple hour set-up time. There are services available to pay for assembly if you feel unequipped to assemble a backyard playground properly. q: Do I need to anchor my playground set to the ground? It depends on the playground set you choose. Some playsets are heavy enough that they don’t need anchors. However, others come with anchors as recommended for proper assembly by the manufacturer. You can always choose to anchor the playset of your choice even if it is not a necessity. q: Do these playground sets require parental supervision? Ultimately it depends on how old your child is whether parental supervision is necessary. Many of the playground sets are safe for children to play on by themselves or with a group, as long as they are in a safe space such as your backyard or indoors. q: Can I set up my playground set inside my house? 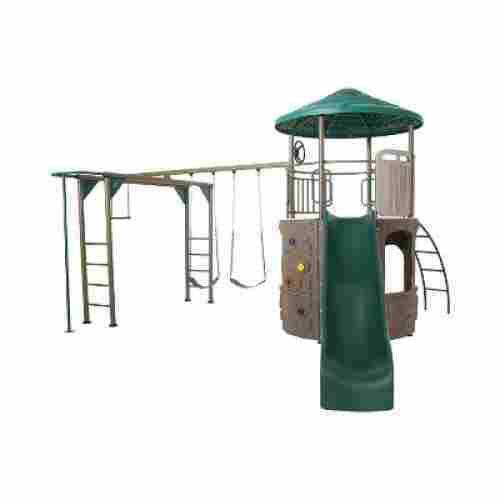 A few of the playground sets on our list are suitable for indoor or outdoor use. It depends on the model and size.